During the White Season, there are plenty of exciting and invigorating activities at Turpin Meadow Ranch. Aside from sitting beside a fire sipping cocoa in a cozy Western cabin with a blanket of snow all around, and eating delicious food prepared by our talented chef, you can enjoy the beautiful landscape and nature besotted by winter’s breath on the back of a snowmobile or fat bike, or on top of Nordic skis or snowshoes on any of the ranch’s 9+ miles of groomed trails, or other nearby roads and trails. One of the enticing adventures for fans of snowshoeing near Turpin Meadow Ranch are Bradley and Taggart Lakes. The lakes turn-off is about an hour away from the ranch via car, and the Teton Park Road closes in winter just past the Bradley and Taggart Lakes Trailhead, making this network of trails convenient (and popular) for snowshoers. The trails around Bradley and Taggart Lakes are easier trails with rolling hills but no steep climbs, suitable for most ages and abilities. The tallest hill is around 150 feet, so it’s a good way for beginners to become accustomed to walking in snowshoes, and all participants can enjoy breathtaking views of the Tetons while getting some exercise. On the Taggart Lake trail near the bottom of the north fork are views up Avalanche Canyon and of Shosoko Falls, two impressive winter landmarks. Although Bradley is the smaller of the two lakes, it has fewer visitors and more of an alpine feel than Taggart Lake. The trail leading to it has several creek crossings (with bridges), and spectacular views of Taggart Lake. Follow the trail down to the lake and pack a winter picnic for a beautiful and memorable lunch. View this winter map of Grand Teton National Park for additional directions. A note about etiquette: as on the ranch, it’s good practice to stay out of the classic ski tracks while exploring on snowshoes. This keeps the paths accessible for Nordic skiers. When you visit Turpin Meadow Ranch this winter for White Season adventures, our trails are available for a small one-time fee for overnight guests. Guests also enjoy a free gourmet breakfast and dinner. Day guests can purchase passes, and meals (including lunch), although dinner reservations are recommended. 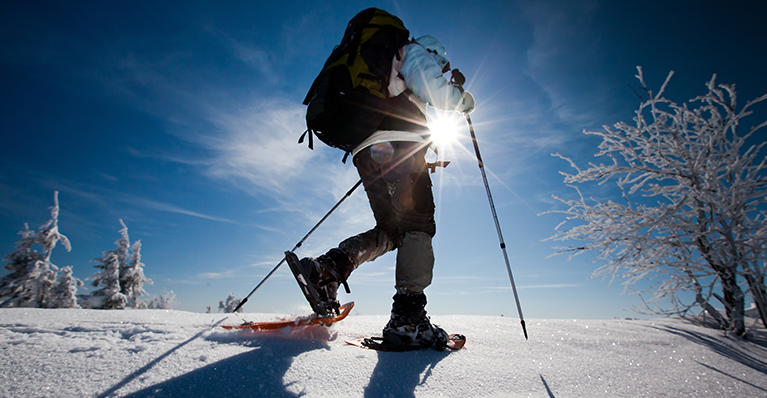 You might be interested in what to bring, gear-wise, when visiting the ranch during the White Season, and also what gear is recommended for snowshoeing. We’re looking forward to seeing you in the lodge by the fire after your winter adventures!